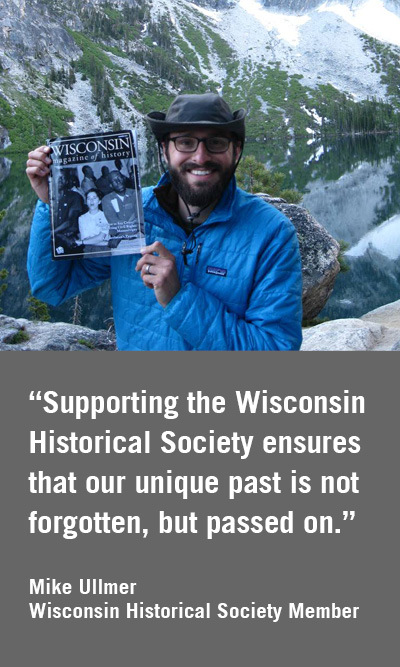 It is because of the vital support provided by the State of Wisconsin, and by dedicated members and donors, that the Society has been able to collect, preserve and share the priceless evidence of the past since 1846. Your membership or donation ensures that our stories, and those of our ancestors, are told for generations to come. The State of Wisconsin provides sixty percent of the Wisconsin Historical Society’s annual budget. Society programs depend on essential gifts, grants and earned income for the remaining forty percent. Your membership and additional donations help to close the funding gap and sustain the programs and services that benefit three million people each year and who rely on the Society each year as their trusted connection to history. We are committed to making the most efficient use of your membership and donations. Please contact us at 888-748-7479 or by email with any questions. *Does not include ticketed events or group/ school tours. Boat trip ticket to visit Black Point Estate purchased separately. X 1 Adult 2 Great for a household with one or two adults! Children Under 18 2 Great for a household that is looking to explore our historic sites and museums! Children Under 18 2 BEST VALUE! Great for the household that wants it all. Free admission and the magazine! Includes all Heritage Circle benefits PLUS even more exclusive-access opportunities! There are many ways to give to the Wisconsin Historical Society. Give a gift to the Society in honor or in memory of someone you care about. It's a thoughtful way to treasure family or friends, and to recognize an individual's life and accomplishments. To learn more about memorial or honorary gifts to the Society, please contact the membership office by email or phone at 608-261-1856. You can help ensure that future generations inherit our collective history by remembering the Society in your will, naming the Society as a beneficiary of your retirement plan, or establishing a life-income or other planned gift. In honor of your commitment we are pleased to recognize you as a distinguished member of the Robert B.L. Murphy Legacy Circle. To learn more about the various ways you can support the Society through gift planning, please visit wisconsinhistory.org/legacy or contact Julie Lussier by email or phone at 608-261-9587. Make your gift go twice as far by having your company match it. Check with your HR department to find out if your gift is eligible to be matched. If your matching gift program requires a printed form, please complete the form and mail it to the Wisconsin Historical Foundation, PO Box 260050, Madison, WI 53726-0050 or fax it to 608-264-6542, attention Wisconsin Historical Foundation. Discover how your company can partner with the Wisconsin Historical Society to present exciting exhibitions at the Society's sites and museums, preserve world-class collections, provide educational programming for schoolchildren, and more. To learn about Business Partner opportunities, please contact Julie Lussier by email or by phone at 608-261-9587. To support the Society with a gift of appreciated stock, please contact Claudia Martinez by email or phone at 608-261-9588. This allows us to give credit to the proper donor when the gift arrives. View Security Delivery Instructions. The Wisconsin Historical Society relies on the generosity of donors to help fulfill its mission of preserving the state's heritage for future generations. The Society's museum, library and archives will accept qualified donations of items and artifacts that represent the experiences of Wisconsinites from many backgrounds and time periods. Learn how to donate to the Museum collections or Library and Archives collections. Bring history to life! Join a team of volunteers who come together in variety of capacities to collect, preserve, and share Wisconsin's stories. By volunteering your time you'll meet interesting people, have fun, and tell the story of Wisconsin while learning more about our state's colorful past. Learn about the Society's current volunteer opportunities. Giving online is safe and secure. Simply fill out the form above to make your secure donation. A confirmation email will be sent when you complete your donation. Want to mail in your donation instead? Print and complete this form (PDF, 674 KB) and then mail it with your payment to: Wisconsin Historical Foundation, PO Box 260050, Madison, WI 53726-0050. To donate by phone, call us toll free at 1-888-748-7479. Our office is open Monday-Friday, 8 am-5 pm. Do you have questions about donating or becoming a member? We're here to help!